The AFRecorder 4800P combines dual channel, fast air-fuel ratio (AFR) measurements with extensive computational capabilities. The AFRecorder 4800P displays the AFRs of each channel, their simultaneous difference, their average, and each channel's AFR deviation. The AFR deviation is the real-time variation of AFR and indicates engine roughness or misfire. Linearized programmable analog outputs and full analyzer control via RS-232 make for easy integration with data acquisition systems. Other features include: recording with built-in statistics, and programmable simulated exhaust gas oxygen (SEGO) outputs. The SEGO outputs can be used to make an engine controller run closed-loop at non-stoichiometric set points. This feature is useful for engine calibration or catalytic converter testing. 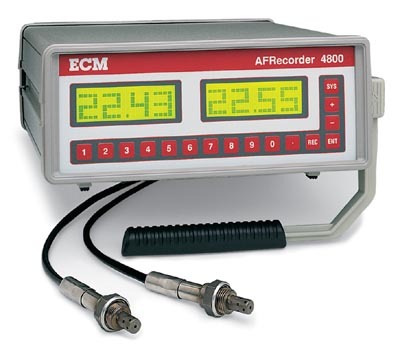 The AFRecorder 4800P can be AC or DC powered and is packaged for dynamometer or in-vehicle use. SEGO (Simulated Exhaust Gas Oxygen) Sensor Outputs: Yes. Dual programmable.